FORWARD OPERATING BASE SALERNO, Afghanistan – Third Battalion, 3rd Marine Regiment marked what was most likely their halfway mark in Afghanistan with a visit from Brig. Gen. Jerry C. McAbee, deputy commanding general of Marine Forces Central Command March 7. 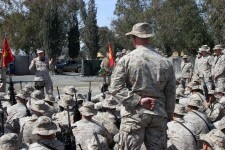 In front of the Battalion’s Combat Operations Center, as helicopters flew in and out of FOB Salerno’s busy airfield, McAbee talked to the gathered Marines and Sailors from Headquarters and Service Company and Weapons Company about what was happening throughout the U.S. Central Command and the Marine Corps. The brigadier general, who formerly commanded Marine Corps Base Hawaii, stressed the importance of the United States’ ongoing commitment to fighting the Global War on Terrorism. As for the state of the Marine Corps, McAbee assured the Marines and Corpsmen that life, as they knew it, would continue on once they returned to Hawaii. No changes to special duty assignments such as Marine Security Guard, Drill Instructor or Recruiting are currently anticipated, he said. The operational tempo of the Marine Corps remains high, he continued, saying that Marines in deployable units could expect to remain on a regular “seven months out, seven months back” schedule for the foreseeable future. Units around the Marine Corps can expect to be refreshed with 3,000 new Marines who are currently being trained, said McAbee. Despite reported recruiting shortfalls Department of Defense wide, the Marine Corps will be able to augment the existing force structure and expand its size by two battalions. Because of this, the Marine Corps should be able to avoid any need to implement stop loss policies or involuntarily extend Marines and Sailors who have reached their end of active service, he said. McAbee concluded by speaking to the future of the Middle East, which will remain the focus of overseas troops for many years to come.